Goodbye x37 abends. Hello productivity and availability. IBM® Tivoli® Advanced Allocation Management is a storage management tool for IBM z/OS® that helps avoid processing delays and interruptions caused by insufficient disk space for storage allocation. It supports SMS and non-SMS data sets and uses rule-based definitions to optimize allocation and reduce x37-type abends. You can gain centralized control of volume use in direct-access storage devices (DASD) at initial allocation and end-of-volume processing. 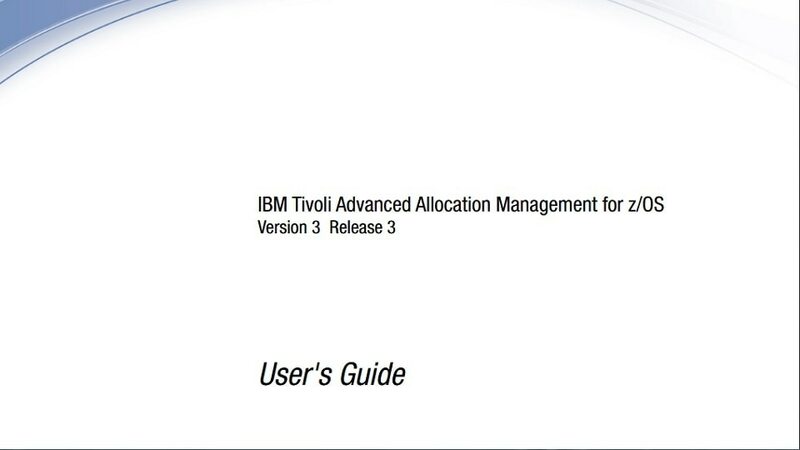 IBM Tivoli Advanced Allocation Management reports total abends and errors avoided or recovered. It can also help prevent JOB FAILED JCL due to insufficient disk space during new allocations. Make your systems and users more productive and boost data availability by proactively intercepting and resolving x37-type abends. Empower administrators to prevent out-of-space conditions and provide continuous system availability for users. Reduce the number of processing errors and the costs associated with them. Enable automatic optimization of direct access storage device (DASD) resources and boost overall resource efficiency. Use IBM Tivoli Enterprise Portal as a common user interface and share information with IBM OMEGAMON® Storage for z/OS to enhance system-wide problem discovery, investigation and resolution.